Now who is this new chap called, the Coyote? Is he related to the author, Truman Capote? He wrote 'In Cold Blood'. He looks like Elmer Fudd. Plus I believe he is related to Don Quixote. Though he's not related to Writer: Mark Waid; Artist: Paolo Rivera; or Publisher: Marvel Comics in October 2012. But I could be mistaken, don' you know. Have you heard of the expression 'A problem shared, is a problem halved'? Yeah! Same here. So what expression would you use when two people have two different problems, and they swap them by default? No. I wouldn't use 'f*cked'. I'd use the word 'NYsCene' -- because that's the name of this Daredevil story. You see, one day, some chap called Diego goes to Foggy Nelsons law office, and explains to him that his sister, Adele, has been arrested for killing the drug-kingpin, Victor Hierra, under some very strange circumstances indeed. Whilst Matt Murdock's dilemma is all to do with his mentally deranged wife, Milla, who suddenly pops up out of the blue, as if nothing was wrong with her. Very strange situations, right? But not as strange as when Matt and Foggy swap problems -- causing Matt's alter-ego, 'Daredevil', to jump at a fall -- where as Foggy unveils someone who's not really there. 'First, check your email. I'm sending information on a recent mob-hit. 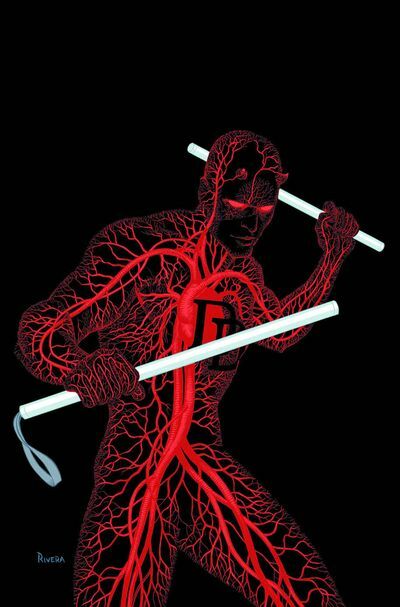 Daredevil ought to snoop around so an innocent nurse doesn't get life... or whacked. I'll call you in a bit, we'll compare notes, after which you do the second thing -- lose my number'. Well, I just love the stilted composition to this sentence, plus the way that the dialogue is structured yet aloof at the same time. Good on you Foggy, ha! Writer, Mark Waid, knows how to tell a story. One hundred percent. Heck, even if a story starts at one place, and then segways into another, he always finds a way to combine both elements together to make everything feel whole again. For example, in this yarn, he does it with Matt's and Diego' situations, amalgamating them as one like a baker baking a cake. Hmmm? Cake? That gives me an idea. This issue was just sublime through and through, and I can't fault it in any way shape or form. However, if push came to shove, there was this one page -- the splash page illustrating Daredevil peering down the elevator shaft -- which felt slightly out of place compared to the rest of the tale, as if it ended before it really did. STORY: As I mentioned previously, one of the most creative things about this issue was how Mark amalgamated two story elements together. However, what I thought was even more creative, is how he took a character we've all seen on television before -- the nurse looking after a bad-guy -- and made her the focal point of one of the story strands. Also, I did get a kick out of Milla's appearance too. ART: There was a panel in this story which spoke a thousand words to me, without saying a single thing. It was the segment where Foggy looked at a picture of him and Matt on the wall together, and I just knew straight away that he would take Diego's case on. Wow! That's what you call 'silent story-telling'. FOGGY: Now if I had to cast this podgy lawyer as a desert, it would have to be something like a 'Chocolate Fudge Cake'. Sweet. Creamy. And slightly fattening to your belly. 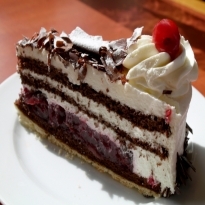 MATT: Where as old Daredevil over here, has to be a 'Black Forest Gateau'. Rich. Soft. Dark. And Light. Without being too sickly either. You Take Two Problems Into The Shower? Not Me. I Just Run And Go! OK, so conceptually this is a story about two people swapping problems, right? Therefore, why not compare it to the Alfred Hitchcock classic, 'Strangers on a Train'. Well, it was a good film, as this was a good story. How the hell can this series get any better? Especially now that Milla is back on the scene again! My God, that was a right turn up for the books I can tell you! Though, like the conclusion to this tale, it did make me wonder if this scenario was real or not. Could it be related to Matt's father's bones perhaps? As well as a secret plan to split Murdock from Nelson? But who? Doctor Doom? Because he has been all over the place at the moment. Or the Kingpin? Because he hasn't. Letters on a post card please dear reader. If not -- spam-spam-spam.